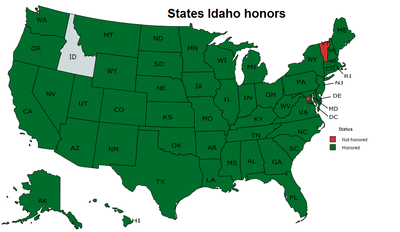 Idaho does not have purchase permits, gun registration, or gun-owner licensing. There are no limits on magazine capacity or weapon types. There is no waiting period mandated for firearm purchases and private gun sales are legal. Concealed weapon licenses are shall issue, no license is required to carry a concealed ​firearm outside of city limits, no license is needed for any Idaho resident (even within city limits), and open carry is legal. Permitless concealed carry is for Idaho residents only. It is legal for an enhanced concealed license holder (18-3302K) or retired law enforcement officer (18-3302H) to carry a concealed firearm on a college or university campus except in dorms or public entertainment facilities. Senate Bill 1389, signed March 25, 2016 by Gov. Otter, grants permitless concealed carry of handguns to all Idaho residents over the age of 21. Idaho has always allowed concealed carry without a permit outside of city limits and open carry was unregulated anywhere by the state (except airports). First, constitutional carry is a misnomer. This applies only to Idaho residents over 21. It is only an expansion of permitless concealed carry to include cities. This bill discriminates against non-residents and is not true constitutional carry, which recognizes that the government cannot regulate who can carry a firearm and in what manner. Vermont by contrast, has never had a law that regulates the carry of firearms, which is true constitutional carry. And could meet the requirements to obtain a concealed weapon license (license not required, but ensuring only law-abiding citizens are granted the exemption). Anyone over 18 may carry a concealed weapon outside city limits as long as they could meet the requirements to obtain a concealed weapon license. Anyone over 18 may obtain a concealed weapon license (not the enhanced license and may not be recognized by other states). National Forest lands in Idaho have no ban on the carry of firearms. The Bureau of Land Management (BLM) prohibits loaded firearms in the Wallace Forest. Firearm carry on Indian reservations is a gray area. Some reservations in Idaho do permit concealed carry with a valid concealed firearm permit, however, it may vary. Tribes cannot enforce tribal law on non-tribal members, though they can enforce state and federal law. You may be trespassed from the reservation and have your firearm confiscated. One should contact individual reservation authorities for clarification of their regulations. ​Generally, state agencies and local governments are prohibited from making their own firearm laws and regulations. This is a concept known as state preemption and intended to promote uniform laws throughout the state. No municipality (counties, cities) or other government agencies can make or enforce firearm laws, rules, or regulations except as specifically authorized by law (18-3302J). The legislature finds that uniform laws regulating firearms are necessary to protect the individual citizen's right to bear arms guaranteed by amendment 2 of the United States Constitution and section 11, article I of the constitution of the state of Idaho. It is the legislature's intent to wholly occupy the field of firearms regulation within this state. ​Except as expressly authorized by state statute, no county, city, agency, board or any other political subdivision of this state may adopt or enforce any law, rule, regulation, or ordinance which regulates in any manner the sale, acquisition, transfer, ownership, possession, transportation, carrying or storage of firearms or any element relating to firearms and components thereof, including ammunition. Minors cannot possess a firearm unless they have the written permission of their parent or guardian to possess the weapon or are accompanied by his parent or guardian while he has the weapon in their possession. 18-3302. Any person traveling to or from any activity described when the handgun is unloaded. 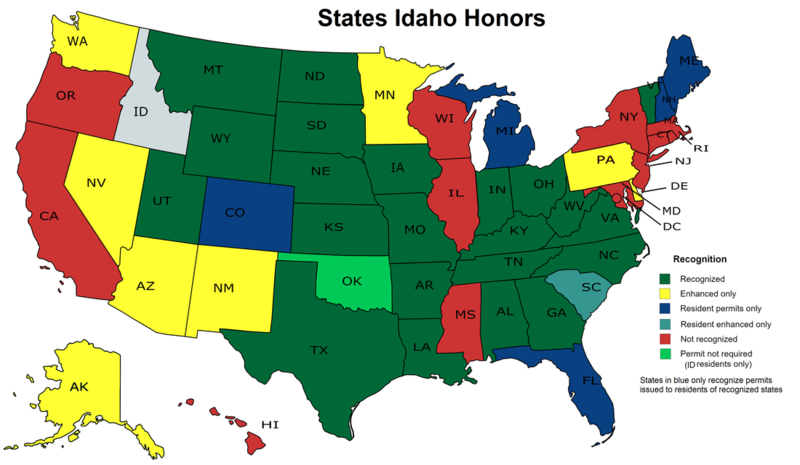 Idaho has both standard and enhanced permits. Resident and non-residents permits are recognized differently from state to state. All citations are Idaho Code (IC) unless otherwise noted.